If you need to send DHL/federate/EMS,please contact us.We need to discuss the freight with you. The DFORCE has always been concerned about product quality.We are developing products and working hard to improve the quality.We will not abandon our reputation because of many cheap products on the market.It is believed that only high quality products can ensure the quality of your work and bring safety to your work. 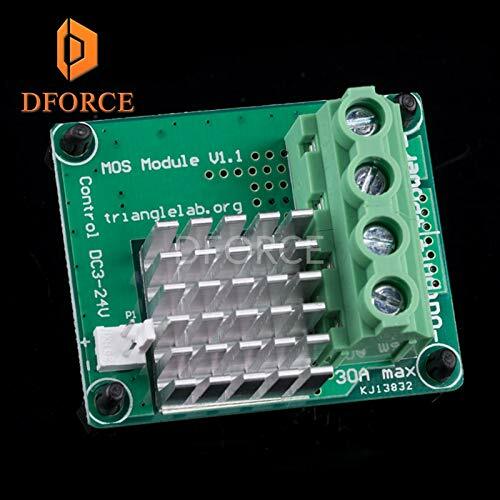 External high current module is a solution for power a large heatbed without blow up the control board of your 3D printer. Each module will doing a load test before delivery. Please mind the anode and cathode of the connectors. Plaese insure the wire of your circuits is big enough for handle such amonut of current. Do not tin the ends of the wire. Preferably,use bootlace ferrules on the end of the wires. Please make sure the screws of the module terminals are tighten up to minimize the contact resistance otherwise the terminals will melt under lager current.